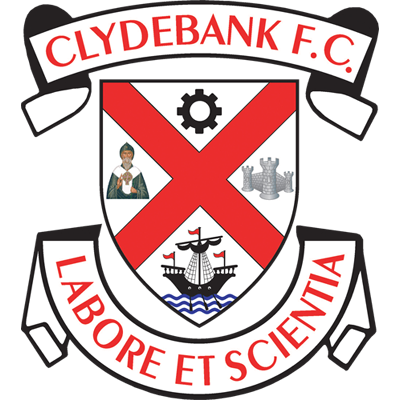 Clydebank maintained their fine run of recent form, and 2nd position in the league table with a third consecutive 2-0 victory, this time Glenafton being the victims. The home side have only themselves to blame for the loss however, as Findlay Frye was given a first half red card for a disgraceful knee high tackle on Ross Alexander in a game that was otherwise fairly contested. The Glens had been the better side at that point of the match, but a goal soon after by Cammy McClair put the Bankies on their way. Nicky Little added the second and his 50th for the club just minutes into the second half killing the game stone dead. The Clydebank support were then treated to a master class on how to play a team with ten men for the remainder of the match. In what seems like a rarity in modern football, Kieran McAnespie fielded the same starting eleven as last week, that breezed past Kilbirnie Ladeside. However, the Bankies were given an early warning that this might not be so easy when Lynass struck the post after only two minutes. The winger’s shot from outside the box skipped off the ground just in front of Waters and the keeper was relieved to see his fumbled save hit the upright and go out for a corner. Clydebank responded minutes later when Cammy McClair stretched his legs with a 50 yard run down the left wing before cutting inside onto his right foot and unleashing a powerful shot that took a deflection of a defender and dropped just a whisker past McGarrity’s left hand post. The Bankies were in again after nine minutes when Shelvey was put clear on the right hand side. He attempted an awkward lob over McGarrity which he was successful in doing, but a defender was back in time to head the ball away for a corner. 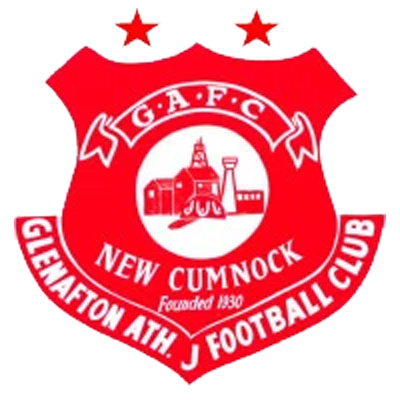 Glenafton settled in after this and were doing most of the pressing, mainly due to the Bankies giving away a series of niggly free kicks allowing the home side to throw the ball into the danger area. However, the Bankies defence were once again being resilient and the Glens were restricted to only half chances. Then, the moment came that changed the course of the match after 23 minutes. 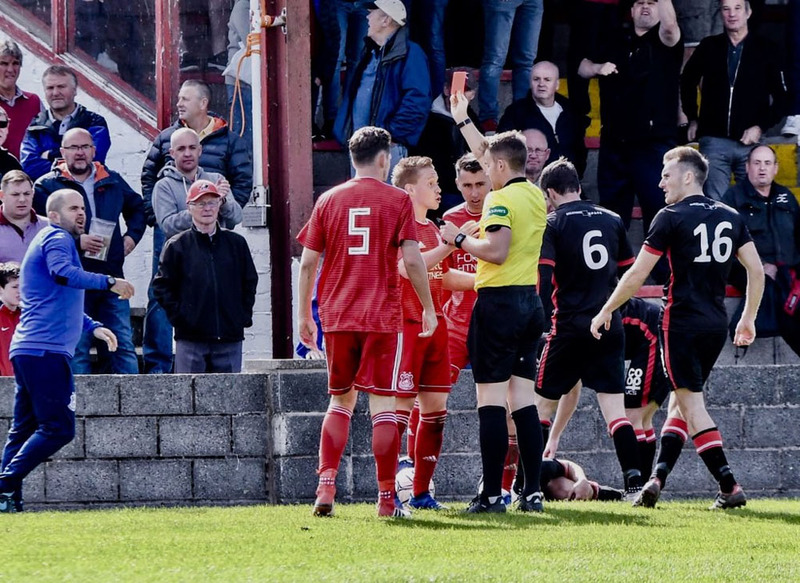 There was a tussle on the touchline in front of the Glenafton dug out, that rightly resulted in a free kick being awarded to the home side, but Frye in a moment of utter stupidity followed through with a studs up, knee high, flying through the air “tackle” that chopped Ross Alexander to the ground. It was a crazy thing to do and referee Scott immediately ordered the midfielder from the field. On the back of losing top goalscorer Chris Dallas to a rib injury, things looked bleak for the Glens. And it only took the Bankies seven more minutes to take the lead. In a similar charge up the left wing to his earlier effort, Cammy McClair let fly with his right foot. His initial shot rebounded back off a defender and back into his path. He made no mistake the second time delivering a fine shot from 20 yards into the net beyond the despairing dive of McGarrity. The Bankies were on top now and pushed for a second goal before the interval. McClair was played in beyond the Glens defence. 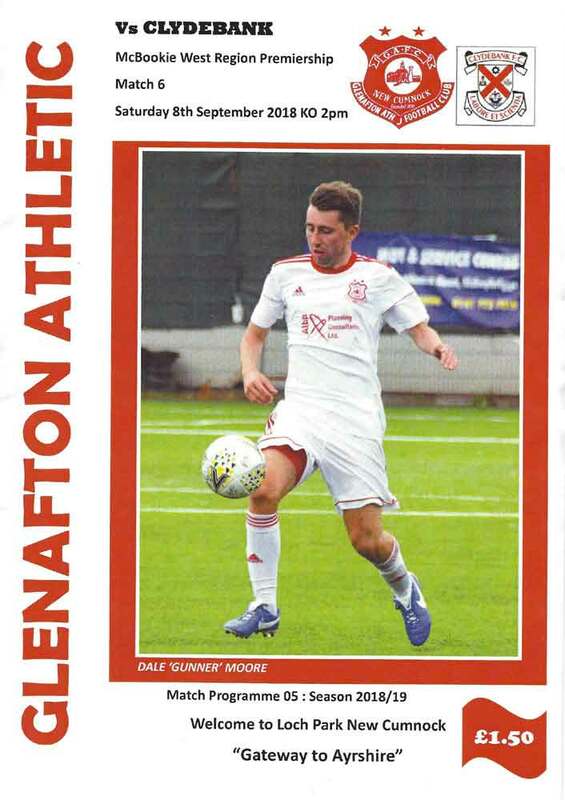 He cut the ball back to Black in the six yard box, but a Glenafton defender managed to get his toe in to save the day, then Alexander switched the ball from right to left and found Andy Paterson who sent in a rasping shot that the Keeper had to be smart to push away for a corner. The Bankies set out to kill the game at the start of the second period and it only took two minutes to do so. Chris Dooley played a lovely ball in-field to Nicky Little. The Bankies forward turned his man superbly and opened up a path to goal. Little hasn’t been missing much recently and sweetly struck the ball low into the bottom corner to score his half century of goals for the Bankies. It was a worthy goal for such a landmark. The Bankies then proceeded to show how to play against a team with ten men. Retaining possession, drawing the opposition out, and picking your times to attack. Glenafton were chasing shadows for much of the remainder of the match. It was superb to see a Clydebank side so much in command of a match against a competitive rival. I would go as far to say it was getting a bit boring, as I desperately wanted the players to go for the jugular. Little could have added two more goals before he was substituted. Rowan sent him through on goal but the keeper did well to parry his shot, then he dispossessed a midfielder who was day dreaming and this time it took the keeper two attempts to collect the ball after another thumping shot. The Bankies used all three subs in the closing stages, and this probably knocked the players off their stride a little as Glenafton showed briefly what they can do. Murphy sent in a diagonal shot with nine minutes remaining that had Waters scrambling across his line to touch the ball around his left hand post. Goalkeeper was equal to the task. For the third week in a row the players deserve all the praise they have been getting. They have beaten three top Ayrshire sides without losing a goal, and the manner of the victories has been just as satisfying. The Bankies only won one of their opening 11 league matches last season, but the fact they have five from seven in the bag already shows the dramatic turn around that McAnespie and McCulloch have affected on this team. The tests keep getting harder though, with a table topping clash against Hurlford United – who have won all seven of their league matches – next week at Lochburn Park to look forward to. Clydebank’s record against the big spending Ayrshire side has not been great in recent years and one the players will be looking to rectify.